Carmel City Hall is located at 1 Civic Square, Carmel, IN 46032; phone: 317-571-2400. Photo: John Kinzer Cabin (ca. 1828) and John Kinzer House (ca. 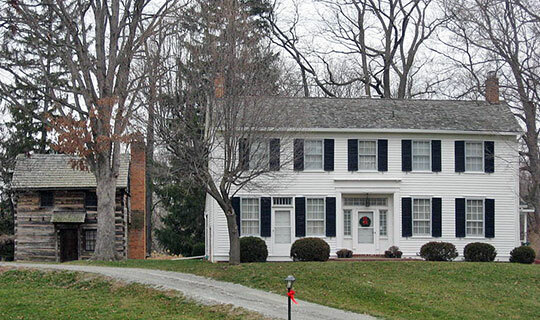 1840), 1732 East State Road 234, Carmel, IN. Listed on the National Register of Historic Places in 1975. Photographed by User:Nyttend (own work), 2012, [cc0-by-1.0 (creativecommons.org/publicdomain/zero/1.0/deed.en], via Wikimedia Commons, accessed July, 2013. Originally named Bethlehem, this town was laid out April 13, 1837 by Seth Green. It was situated 4 miles south of Westfield on the road leading from Westfield to Indianapolis. The original town consisted of 14 lots. The first dry goods store was opened by a firm by the name of Boggs & Boggs, the store room being an old log cabin. They did not remain long and were succeeded by Elijah King. Other business men were: M. L. Long & A. Peacock, shoemakers; R. Craven & Isaac W. Stanton, harness makers; Harrold & Green, tile manufacturers; Blanchard & George, livery stable, and Calvin Bond, the first undertaker. The first dentist was William Frost. The physicians were Drs. Carey and Campbell. The post office was established in 1844, and the first postmaster was Joseph Macy. The Methodist Episcopal Church was first organized in Carmel in 1848, the membership numbering about 12. The first meeting of the Society of Friends' Church ever held in the county was a little north and west of Carmel, in 1830. A meeting house was erected about the year 1833. It was called Richland. Augustus Finch Shirts, A History of the Formation, Settlement and Development of Hamilton County, Indiana, from the Year 1818 to the close of the Civil War, Augustus Finch Shirts, Noblesville, 1901.